EPA Administrator Scott Pruitt told representatives of a children’s health group last week that he wants to eliminate lead from drinking water within 10 years, a goal that public health advocates say is both highly ambitious and confusing given Pruitt’s efforts to scrap or weaken other environmental initiatives. 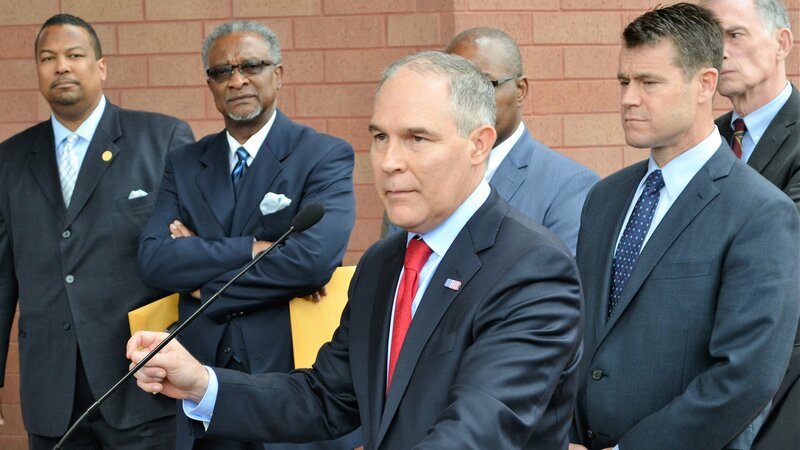 During a Jan. 9 meeting with members of the advocacy organization Moms Clean Air Force, Pruitt “spoke quite passionately about how lead really takes a toll on mental acuity in children,” said Dominique Browning, the group’s senior director. The Trump-appointed EPA leader hinted at the goal during a Dec. 7 hearing before the House Energy and Commerce Committee, during which he called lead in drinking water “one of the greatest environmental threats we face as a country” and said he hoped to work with the committee in 2018 on a strategy to “eradicate those concerns” over 10 years. “It’s going to be a very ambitious initiative of our agency,” Pruitt said during the hearing, adding that 17 offices within the EPA were working on lead-related problems. The issue of lead in drinking water has been top of mind across the U.S. since the Flint water crisis began making headlines in 2014. The EPA and the Centers for Disease Control and Prevention both say no amount of lead in water is safe. In children, low levels of exposure to lead have been linked to nervous system damage, learning disabilities, stunted growth, impaired hearing and impaired formation and function of blood cells, according to the EPA. Pruitt’s apparent urgency to address the issue has taken some environmental advocates by surprise, given his history at the agency. Over the past year, Pruitt has sought to delay or block more than 30 environmental regulations, including the Obama-era Clean Power Plan and Clean Water Rule. He has also overturned a proposal to ban a pesticide that causes brain damage in children and sought to eliminate two programs focused on limiting children’s exposure to lead-based paint – all while shrinking staffing at the EPA to its lowest level in 30 years and seeking to slash the agency’s budget by 31 percent. Browning said Pruitt did not provide details on how he would achieve the lead-free drinking water goal during his meeting with her group last week. Mae Wu, a former member of the EPA’s National Drinking Water Advisory Council, said agency officials have offered no information about a plan to eliminate lead from drinking water. In 2015, NRDC found that more than 18 million Americans were served by community water systems that had violated the EPA’s Lead and Copper Rule, which limits the concentration of lead and copper in public drinking water. Although current regulations require water suppliers to treat systems with chemicals that protect against lead, the only way to eliminate lead from drinking water is to replace the 6-10 million lead service lines that remain in the U.S., Wu said. Despite the health risks posed by lead pipes, Chicago has resisted calls to overhaul the city’s estimated 385,000 lead service lines, even as cities like Milwaukee, Pittsburgh and St. Paul launch replacement programs, as detailed last year by the Chicago Tribune. The Tribune reported that Chicago has more lead service lines than any other city and required them by law until 1986, when Congress banned the use of lead pipes to deliver drinking water. “I don’t see him advocating for the [funding] needed to be able to afford this capital project,” Wu said. Asked for specifics on how the EPA plans to achieve Pruitt’s goal, an agency spokesperson highlighted the EPA’s ongoing work to update the Lead and Copper Rule, which was last revised in 1991. The spokesperson also referred to comments made by Pruitt during the December hearing, when he expressed his hope to develop a strategy. July 14: Elevated lead levels have been found in hundreds of water fixtures in Illinois’ second largest public school district following an initial round of testing earlier this year. Could Milwaukee Be a Model for Replacing Chicago’s Lead Water Pipes? May 5: Organizers of a clean water summit in Chicago next week hope to draft a plan for replacing the city’s nearly 400,000 lead water pipes. May 3: A new report shows that in 2015, Illinois ranked among the five worst states in terms of largest populations served by water systems with health violations.